The Hoodoos adorn the landscape of Banff National Park in Alberta, Canada as a river below works its way around the forested wilderness. The Hoodoos that adorn the landscape in Banff National Park in Alberta, Canada are columns of rocks that have been brutalized by the different climates along the Milk River. The Hoodoos are extremely interesting to see and from this viewpoint, you can look across the stunning green wilderness where the Milk River separates around the landscape. 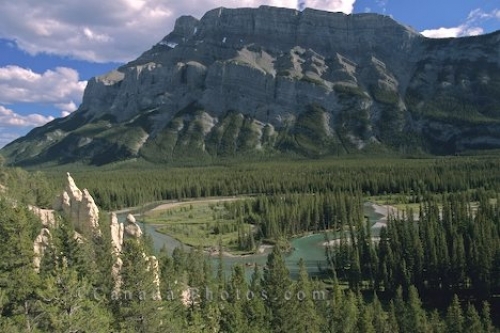 Hoodoos in Banff National Park, Alberta, Canada, North America. Picture of the stunning landscape of Banff National Park in Alberta where the intriguing rock formations of the Hoodoos stand.